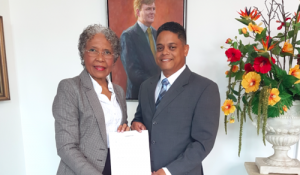 WILLEMSTAD - The Governor of Curaçao, Her Excellency Lucille George-Wout, has received the final report of the ‘formateur’, Eugene Rhuggenaath. Rhuggenaath has agreed to form a cabinet based on a majority in Parliament, consisting of the political parties PAR, MAN and PIN. In addition, Mr. Anthony N.V. Begina, will be appointment as Plenipotentiary Minister in The Hague and Ms Eunice M.D. Eisden, as Deputy Plenipotentiary Minister. The screening conducted on the basis of the National Ordinance on Integrity (Candidate) Ministers have not provided any information that precludes the appointment of the candidate ministers. Following the agreement between the Governor and the ‘formateur’, it is decided that the swearing in of the proposed ministers Rhuggenaath, Alcala-Wallé, Girigorie, Koeiman, Gijsbertha, Konket and the Deputy Plenipotentiary Minister Eisden, will take place on Monday, May 29, 2017, at 10.00 in the Governor’s Palace. The proposed Ministers Jesus-Leito, Martina and the Minister Plenipotentiary, Begina, will be sworn on Friday, June 2. The Governor has stated to Mr. Rhuggenaath her appreciation for the way in which he performed his assignment as a ‘formateur’.